This is one of the finest surviving examples of a technology that helped to transform Ireland in the ninth and tenth centuries: a Viking sword. With its cutting edge almost perfectly preserved in some places, it retains the ferocity that helped to make the Scandinavian warrior such a formidable force. 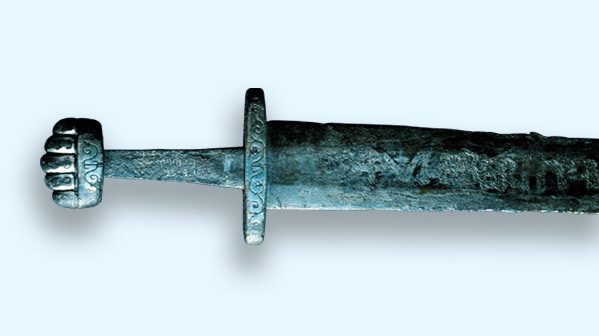 Swords like this did not just allow the Vikings to ravage parts of Ireland; they forced indigenous Irish rulers to adapt to the demands of new warfare. The Vikings typically imported their blades from high-quality workshops in the territory of the Frankish empire (today’s Germany). The blade of the Ballinderry sword has a maker’s name inlaid on it: Ulfberht. This identifies it as the work of a master, probably based in the Rhineland, whose blades have been found as far away as Russia. Over 150 of these blades have been discovered, suggesting that this was the early equivalent of a brand name, with an international cachet. There is even evidence of a division between genuine Ulfberht blades and cheaper forgeries; an early mediaeval case of brand piracy. While the blade may have been imported, the hilt and pommel were made in Scandinavia. This one is particularly fine, decorated with hammered silver and carefully inscribed with lettering and abstract patterns. The upper side bears the name Hiltipreht, which may connect it to a Norwegian craftsman of that name. There is little doubt that this is a very high-status object that came to Ireland with the Vikings. What is fascinating is where the sword was found in 1928: on the site of a crannóg, or lake dwelling, at Ballinderry, near Moate, Co. Westmeath. It was found with other Viking objects—a longbow, two spearheads, an axehead and a gaming board—but a crannóg is a distinctively Irish form of dwelling. ‘Crannógs are such an Irish type’, says Andy Halpin of the National Museum, ‘that it is very hard to believe this was a Viking site. So the best interpretation is that you are looking at an Irish chieftain or petty king who is wealthy enough to equip himself with the best of weaponry’. He is obviously in contact with Viking Dublin, or Limerick, which is not surprising because we know that, for this east midlands area, there was huge trade going back and forth. This sword symbolises, in a way, the long-term impact of the Vikings. If you are an Irish king and you have the Vikings on your doorstep, you need to get your act together. You need to have this sort of weaponry, but in order to have it, you need to be able to buy it, which means changing to an economic system that generates cash. This arms race did not just affect the relationship between the Irish kings and the Scandinavian newcomers. It also set off a Darwinian struggle among the Irish themselves. The kings who could adapt to the Viking threat by acquiring the new technology could also compete more successfully against local rivals. Even more than their direct impact, which was shocking but relatively limited, it was these indirect effects that made the Vikings a catalyst for the transformation of Ireland.